Shep Bostin is an Enterprise Architect for Hewlett Packard Enterprise (HPE), which is headquartered in Palo Alto, California and has offices around the globe. HPE (NYSE: HPE) is a global technology leader focused on developing intelligent solutions that allow customers to capture, analyze and act upon data seamlessly from edge to core to cloud. Shep supports HPE's Federal Systems Integrator partners in addressing the complex enterprise technology needs of large Federal government agencies and programs. Recently, Shep was a Solutions Architect with ePlus Technology, inc., which is based in Herndon, Virginia (NASDAQ: PLUS). At ePlus, Shep supported ePlus' customers and sales team throughout the Mid-Atlantic region in designing solutions to enterprise technology challenges, with a particular focus on technologies from HPE and Fortinet (NASDAQ: FTNT). Previously, Shep was the Enterprise Solutions Specialist for Daly Computers, Inc. in Clarksburg, Maryland. Daly specializes in Information Technology solutions for customers in the "SLED" market  State and Local government, and EDucation (both higher ed. and K-12). Shep worked with both the Sales and Technical Services teams to deliver the right technology solutions needed to meet customers' wide-ranging needs. He helped develop the overall strategy for Daly's Enterprise Practice Group, and educated both internal and external constituencies on technology strategy, products, and enterprise architecture. Before joining Daly, Shep was contracted in 2014 to serve as the Vice President, Strategic Partnerships and Business Development for Diamond Mind, Inc., where he created a tiered Partner Program, wrote 20+ Go-To-Market plans and competitive analyses, and was the #1 contributor to the company's strategic knowledgebase. For more than a dozen years, Shep was the Franchise Owner and General Manager for Geeks On Call® in Montgomery County, Maryland, where his team provided information technology services to hundreds of small to medium-sized businesses. 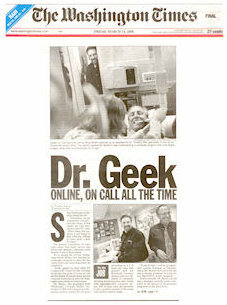 As one of the first Geeks On Call franchisees in the country, as well as a recognized technology expert, Shep appeared locally on NBC4 News, FOX5 News, and NPR's Kojo Naamdi radio show, as well as being featured in articles in U.S. News and World Report, The Washington Post, The Washington Times, The New York Times, The Wall Street Journal, PC Magazine, Time Magazine, The Washington Business Journal, The Business Gazette, and more than 100 other periodicals, radio shows and television programs. Prior to opening his Geeks On Call business in early 2002, Shep was Chief Operating Officer of a publicly-traded Internet company. He has more than 25 years of executive management, product management, technology marketing, product development, enterprise architecture, and technology consulting experience. Shep has delivered presentations for groups ranging from a intimate executive briefings up to thousands of people. In addition to his business responsibilities, he has served as Chairman of the Geeks On Call Franchise Advisory Council, Chairman of the Montgomery County Cable and Communications Commission, President of the Gaithersburg chapter of Business Network Intl., and President of the Manor Ridge Homeowners' Association. Shep holds a Bachelor of Science degree, with honors, in Information and Decision Systems from Carnegie Mellon University and is a graduate of Phillips Academy at Andover. You may also view Shep's complete resume.